Scene of the Crime - Out Now! Colin Currie releases the second album, The Scene of the Crime, on his critically acclaimed label, Colin Currie Records on 26 October. Currie joins forces with collaborator and friend Håkan Hardenberger for the disc, which presents four works commissioned and written for Currie and Hardenberger alongside André Jolivet’s Heptade. 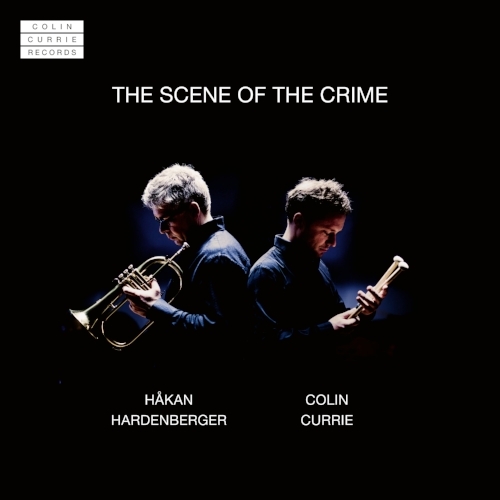 The album takes its name from Brett Dean’s 2017 composition ...the scene of the crime..., which is the Australian composer’s homage to the pair’s skill and infectious drive, scored for trumpet, flugelhorn and drum kit. Joe Duddell’s Catch pairs marimba and trumpet in a lively, up-tempo score blurring the musical hierarchy of soloist and accompanist. Tobias Broström’s Dream Variations evokes the paintings of Swedish artist Claes Eklundh through use of sustained percussion including Java gongs, vibraphone, and dubaci. The music of Daniel Börtz is often mystical and highly emotive, and Dialogo 4 is no exception, the trumpet and percussion in partnership creating an immersive atmosphere. Written in 1971, André Jolivet’s Heptade is the earliest work on the album, and is perhaps the archetypal 20th-century pairing of these two instruments. The late French composer’s music tasks Hardenberger with a fiendish trumpet part while Currie deftly handles a dizzying array of unpitched percussion throughout. "The album marks the debut of Colin Currie Records, a promising new outlet for the artistry and flair of Britain’s most adventurous percussion player." "a spectacular first release for the Currie label."